Holy bungled distribution Batman! The wrong trailer has been sent out! Or was it? Audiences in America who turned up to see an Imax preview of I am Legend, this week, have been treated to an apparent accidental taster of the forthcoming Batman movie, The Dark Knight, which is not due to arrive until July next year. Six minutes of the film were “accidentally” screened in Imax cinemas and the bootleg quickly leaked on to the internet. The scene shows an intense bank robbery, not dissimilar bank-heist sequence from Michael Mann’s Heat, in addition to shots of the Heath Ledger’s Joker and some extra scenes from the movie (you can see the official trailer here). But although Warners pulled the bootleg preview from YouTube earlier today, you can’t help but wonder if this was accident or design. Set designs and short clips are routinely leaked months before the theatrical release (just take these recent shots of the set from the upcoming adaptation of The Watchmen). Seeing that Dark Knight has already one of the most elaborate viral campaigns for a forthcoming movie, it does make you wonder. For all those that saw it reported that the six minutes of raw action didn’t half leave them panting for more. The Joker couldn’t have planned it better. 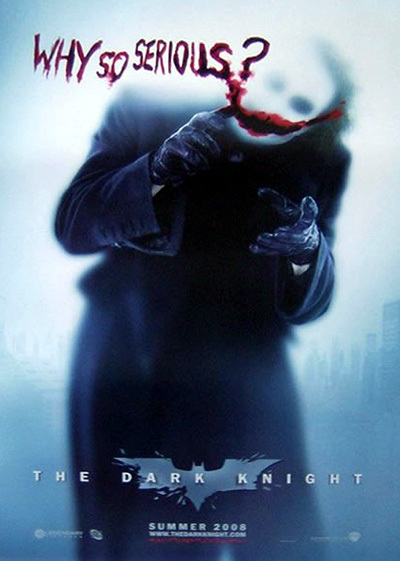 I got it off a download link a (regular and legitimate) poster on a popular Dark Knight forum uploaded. The other guys on the forum were paranoid it was a virus, but I took my chances and then stuck in on the tube. I’m seriously doubt WB were directly involved. Whether they were hoping it was leaked is a different matter. And the six minute prologue was supposed to be shown with the IMAX previews, it wasn’t accidental. It was advertised right, left and centre.